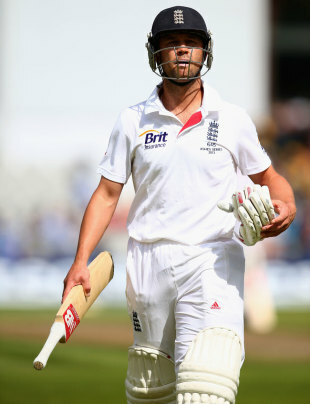 England could not have been more anxious to underline that they cared about the well-being of Jonathan Trott. The ECB's outgoing managing director, Hugh Morris was anxious to stress it at every opportunity. So, too, did the team director Andy Flower. There is no intention to question their good intentions because both are decent men. But high-level sport burns people, and always will, and there was no doubt about the acrid smell in the air. Trott, as committed a cricketer as it is possible to be, has become collateral damage in an Ashes series that England's captain, Alastair Cook, had described as a war. There have been six of these wars in a little over four months and there are still four to come until early in the New Year. This is how we like our sport: hard, unyielding, the outfield scarred with winners and losers. Failure has never been less forgiven. But as Trott flew back to the UK - and to imagine his state of mind on that endless flight is to reflect upon a heavily-curtained exhaustion, a feeling of nothingness, that we can barely contemplate - a comment by an England player last summer came to mind. For his own sake, his identity will remain secret because his assessment went to the heart of England's approach. "It can feel as if there is no escape," he said. "It as if everything you do is being assessed, as if every little thing you do is being marked and analysed and stored away. If you are not careful, it can wear you down. It's incredibly difficult to come to terms with it." England talk proudly of their extensive "support network", and there is no larger or more committed backroom staff in cricket. But the primary focus of England's support network, naturally enough, is to win cricket matches. Duty of Care is the fall back position if the overriding desire for victory malfunctions. The "bottom line", as Flower had it, is simply that England fight back in the second Test in Adelaide. It was revealing that Flower compared Trott's long-term management of his illness to a player managing a long-running hamstring problem. In both cases, the top player wants to be fit to play and the management's priority is to get that player on the field. It is not entirely clear how concerned England were ahead of the first Test, but Trott's state of mind will have been carefully monitored. They patched him up and got them out there, and it is exactly what he would have wanted. You have to put yourself on the line for sporting glory and financial rewards few can dream of. England's improved performances over the past decade have been won in a very English way: by the use of their financial muscle and superior organisation to measure the impact of everything which might impact on England's performance to a small degree. We have recently alighted on the fact that there is a 72-page England cookbook and, wondering if maybe things were getting out of proportion, and feeling frivolous, we had a laugh about it. But that is one example among many. Michael Atherton, an England captain in a simpler age, wondered to Flower upon the news of Trott's departure if this micro-management had inadvertently become part of the problem. It was a good question. Flower responded by listing the outings organised on behalf of England's players to help them gain a perspective on life: the battlefield at Ypres, a burns unit in Dhaka, an orphanage in Kolkata and the visit ahead of the Ashes tour to a recovery unit in Surrey for injured servicemen. All of them are designed with good intentions to remind the players that playing international sport is essentially something to be cherished. Yet even these trips have serious intent and represent just another aspect of their lives that are organised on an England cricketer's behalf, crammed from time to time into a packed international schedule. There is not much room for self-ownership, for the refreshment found in individual liberty, for encouragement for a player to broaden his mind in whatever way a person chooses as long as it does not involve cricket. Atherton concluded in The Times: "Every whim is catered for. The impression is of a closed, institutionalised and claustrophobic world." He might have added "obsessive". The next time an England player falls off a pedalo in the early hours of the morning it will probably emerge that it was part of a study into whether the combination of salt water and exercise could create a faster recovery from alcoholic excess. Perhaps for their own state of mind what all England players need is the chance to find themselves once in a while, to behave as human beings not cricketers, to spend more time in any way they want to spend it, to get to 11 o'clock at night and think: "I skipped the gym today and, do you know, I'm not guilty about it." To learn that Alastair Cook works long hours on the farm or that Graeme Swann still occasionally sings in the band is a good thing. Coping mechanisms are being quietly replenished. On spare days in summer, though, many of us grouse that they are not doing their bit by playing more county cricket. Trott can be assured of committed professional support. The experience provided by Marcus Trescothick's illness changed English cricket forever. "We have spent a lot of time and effort making sure we have the best possible support services in place," Morris said. "We have an outstanding medical team. They have access to a network of consultants in various medical disciplines and whether a player is physically injured or has a mental illness they will be provided with the best possible care. It is something we take very seriously in conjunction with the PCA." Stress-related illness, depression, call it what you will - because it is a generic description for conditions which are finally being recognised, but which are far from understood - can strike anywhere. Statistics from the Mental Health Foundation suggest that 9 per cent of people in the UK reach the criteria for medical diagnosis in any one year. Crudely put, that equates to one per cricket team. Trott should draw strength from the fact that stress-related depression has been referred to as the Carers' Illness: often suffered by those with high standards and aspirations, those who seek to fulfil their potential and when they meet obstacles do not give up but fight ever harder, ever more obsessively, often finally to their own detriment. If he proves to have played his last for England, he has given his all. There is no shame whatsoever in that. Martin Crowe When does the quest for perfection become a curse?